DENMARK/GERMANY: The two cables comprising the 400MW Kriegers Flak link between Germany and Denmark have been installed. The 25km link between the Baltic 2 offshore project, and the substation for the Kriegers Flak project is a joint project between transmission system operators 50Hertz (Germany) and Energinet.dk (Denmark). Two cables are installed between substations of Vattenfall's 600MW Krieger's Flak offshore project and the 288MW EnBW Baltic 2 site. Despite being in different countries' waters, Krieger's Flak and Baltic 2 are located less than 30km apart. 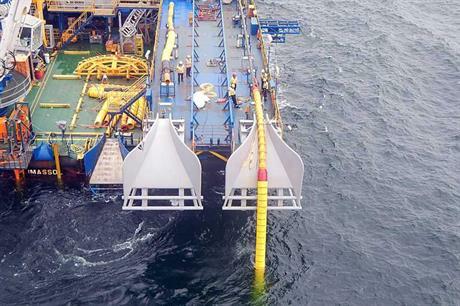 It is the first time an interconnector has been installed using the infrastructure of offshore wind projects. "In the business everybody knows how complex the installation of submarine cables can become; especially in this case we have pulled in the cables without any interruption of the operating platform (Baltic 2)," said Elke Kwapis project manager of the combined grid solution at 50Hertz. Vattenfall's 600MW Kriegers Flak wind farm will use Siemens Gamesa turbines and be built in two parts, a 200MW western section and a 400MW eastern site. Vattenfall won the licences to build the offshore wind project in a November 2016 tender, for a support price of €49.90/MWh excluding transmission costs.